In anatomy, a ligament is the fibrous connective tissue that connects bones to other bones and is also known as articular ligament, articular larua, fibrous ligament, or true ligament. "Ligament" most commonly refers to a band of dense regular connective tissue bundles made of collagenous fibers, with bundles protected by dense irregular connective tissue sheaths. 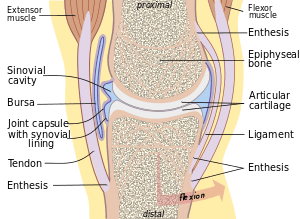 Ligaments connect bones to other bones to form joints, while tendons connect bone to muscle. Some ligaments limit the mobility of articulations, or prevent certain movements altogether. Ligaments are viscoelastic. They gradually strain when under tension, and return to their original shape when the tension is removed. However, they cannot retain their original shape when extended past a certain point or for a prolonged period of time. This is one reason why dislocated joints must be set as quickly as possible: if the ligaments lengthen too much, then the joint will be weakened, becoming prone to future dislocations. Athletes, gymnasts, dancers, and martial artists perform stretching exercises to lengthen their ligaments, making their joints more supple. ↑ Daniel John Cunningham (1918). Cunningham's text-book of anatomy (5th ed.). Oxford Press. p. 1593.